Your current web browser is outdated. For best viewing experience, please consider upgrading to the latest version. Four decades after the great victories of the Civil Rights movement secured equal rights for African Americans, black America is in crisis. Indeed, by most measurable standards, conditions for many blacks have grown worse since 1965: Desperate poverty cripples communities nationwide, incarceration rates have reached record highs, teenage pregnancy and out-of-wedlock births are rampant, and educational failures are stifling achievement among the next generation. For years, prominent sociologists and pundits have blamed these problems on forces outside the black community, from lingering racism, to the explosion of the inner-city drug trade, to the erosion of the urban industrial base and the migration of middle-class blacks to the suburbs. But now, in an important and broad-ranging re-envisioning of the post-Civil Rights black American experience, acclaimed author John McWhorter tears down these theories to expose the true roots of today's crisis, and to show a new way forward. In Winning the Race, McWhorter argues that black America's current problems began with an unintended byproduct of the Civil Rights revolution, a crippling mindset of "therapeutic alienation." This wary stance toward mainstream American culture, although it is a legacy of racism in the past, continues to hold blacks back, and McWhorter traces all the poisonous effects of this defeatist attitude. In an in-depth case study of the Indianapolis inner city, he analyzes how a vibrant black neighborhood declined into slums, despite ample work opportunities in an American urban center where manufacturing jobs were plentiful. McWhorter takes a hard look at the legacy of the Great Society social assistance programs, lamenting their teaching people to live permanently on welfare, as well as educational failures, too often occurring because of an intellectual climate in which a successful black person must be faced with charges of "acting white." He attacks the sorry state of black popular culture, where indignation for its own sake has been enshrined in everything from the halls of academia to the deleterious policy decisions of community leaders to the disaffected lyrics of hip-hop, particularly rap's glorification of irresponsibility and violence as "protest." In a stirring conclusion, McWhorter puts forth a new vision of black political and intellectual leadership, arguing that both blacks and whites must abolish the culture of victimhood, as this alone can improve the future of black America, and outlines steps that can be taken to ensure hope for the future. Powerful and provocative, Winning the Race combines detailed research with precise argumentation to present a compelling new vision for black America. John McWhorter is the author of ten books, including the New York Times bestseller Losing the Race: Self-Sabotage in Black America, the national bestseller The Power of Babel: A Natural History of Language and most recently Doing Our Own Thing: The Degradation of Language and Music and Why We Should, Like, Care. A senior fellow at the Manhattan Institute, he holds a Ph.D. in Linguistics from Stanford University and is a frequent media commentator on race, language, and culture. He lives in New York City. "Indeed, the U.S. is the only prosperous democracy to have a large, racially distinct underclass where unemployment, criminality and fatherless families are too often the norm. Why this is so and what we are to do about it is the principal theme of John McWhorter's splendid "Winning the Race." In particular, Mr. McWhorter examines why the optimism that defined the years of the civil-rights movement has been replaced by defeatism and alienation in the black community—even as America's racial attitudes and policies have changed so dramatically for the better." "Ours is a time of so much surrender to hopelessness or condescension that John McWhorter stands apart from either crowd and asserts remarkably strong arguments for optimism. He also demolishes intellectually shoddy evasions of the hard blue facts. At the same time, he rises above the simplifications of liberal or conservative, and looks at our troubles free of sentimentality or self-serving ideology. One does not have to agree with every position-or approve of the amount of time he takes swatting the gnats who have attacked him-to realize that this is the work of a serious man who knows what the demons are and realizes that they must be identified and fought, not glibly redefined so as to maintain the old order of mush-mouthed ineffectiveness." 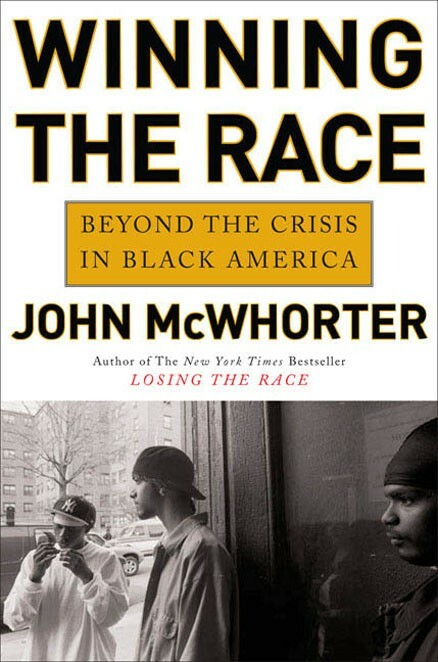 "John McWhorter demolishes the liberal conventional wisdom about the sources of poverty, crime, family breakdown, and other social ills that afflict the black community today, and offers a compelling alternative vision of how to move beyond the current crisis. An engaging blend of scholarly analysis and personal observation, Winning the Race is a must-read for anyone with a serious interest in the problem of race in modern America." The Manhattan Institute is a think tank whose mission is to develop and disseminate new ideas that foster greater economic choice and individual responsibility.